This is the Original Ringmaster that has been the secret tool of segmented bowl makers for over 30 years. New Lower Price!!! Buy Now! Stop turning expensive exotic wood into exotic sawdust. 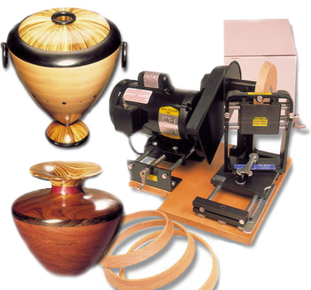 If you are trying to make wooden bowls, vases,or other hollow vessel, the Ring Master is a must have in your work shop. Amazing works of art are easily produced on the Ring Master. Beginners will enjoy the satisfaction of producing a finished bowl or vase they can be proud of. Experts will be able to create fine works of art that will quickly pay for the Ring Master. Segmented bowls are made quickly and efficiently on the Ring Master yielding stunning results. The Ring Master is designed to work with 4/4 hardwood lumber planed down to a maximum of 15/16 inch thick. Using flat boards 12 inches wide the Ring Master’s double cutting blades cut from the front and back of the board to produce straight and angled rings. The Rings are then stacked one atop another to produce the desired shape. Large objects can be produced with very little waste. ***New pulley system has larger pulleys for more contact area with the belt resulting in more power and less slipping. * Ring Masters are offered without a motor for international use where power is not compatible with US 60 Hz motors or users without electricity. A motor or other means to drive the unit must be supplied by the customer. Customer is responsible for choosing a compatible motor and mounting it in such a way that it is safe to use. No warranty is given for Ring Masters shipped without a motor.